Solar Power Projects and Wind Farm Erosion & Dust protection Solutions. Protect your Solar Power / Energy Farm Investment! When it comes to solar power plants, the effectiveness is based on performance of the Solar panels. In order for the Solar panels to perform they need to be free from dust -making Dust Control a critical part of the maintenance costs of any Solar project. Clean Panels: The single largest factor to preventing Solar panels from operating at their maximum capacity is Dust — Dust can absorb sunlight on the surface of a panel, reducing the light that reaches the cells. Clean surfaces result in increased output performance over the lifespan of the equipment. Taken from the article “The Dirt on Solar Panels” posted by Achelle Santos on November 2, 2012 on the begreen.botw.org website. This maintenance can be both time consuming and expensive. Soil Solutions provides important solutions that address these challenges. Ground Erosion: A naturally occurring process in nature, soil and ground erosion are caused by water and wind. Expected as a gradual occurrence and planned for at a certain periodic rate, sudden erosion can have a very detrimental effect on a Solar Energy Plant . Loss of topsoil can lead to reshaping of the ground and the creation of channels, holes and slopes in earth. This could cause racking to shift affecting the ability of panels to generate the energy. It could also lead to flooding and destruction of equipment. DUST CONTROL : Treating the solar farm and surrounding area with a topical EBS Soil Stabilizer surface seal, and treating all access roads, servitudes and pathways with EBS — this will allow for a dust free area, treating the surrounds will significantly reduce fugitive dust thus resulting in improved performance of the solar panels as well as increased life span. 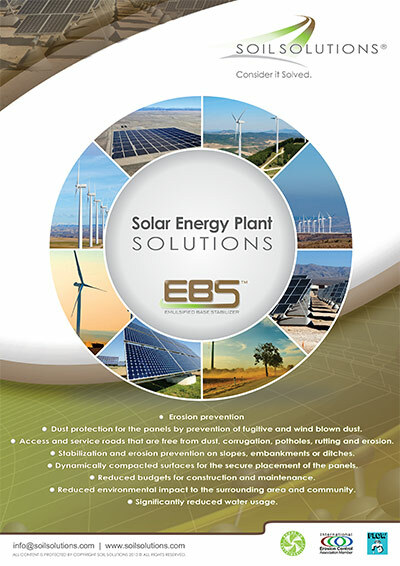 EROSION CONTROL: Treating the ground and access pathways within the Solar Plants with EBS Soil Stabilizer will prevent this — One Application will perform for five or more years, and protect the area against erosion. Dust protection for the panels by prevention of fugitive and wind blown dust.